Tracy went above and beyond with this page. It’s rather large, but very well done, and he even added a nice action scene into the mix, at the expense if adding an extra half page to the comic. Our holiday tale has reached it’s climax now. Enjoy! Sonic Eggs is a weekly comic strip from Emerald Coast Comics. Sonic Eggs is a spoof/continuation of Archie’s Sonic X comic book series, which itself was an in continuity expansion of the first series of the Sonic X TV series. It’s written by TSS’s Jason Berry. You can find the series on Emerald Coast Comics, a repository of Sonic fan comics I suggest you all take a look at. It’s not all good stuff, I recommend you stay away from Staffers, but still check it out! This page continues on from where the last page left off yesterday. This page was written by Jason Berry, edited by myself and drawn, colored, and lettered by the ever so awesome Tracy Yardley! 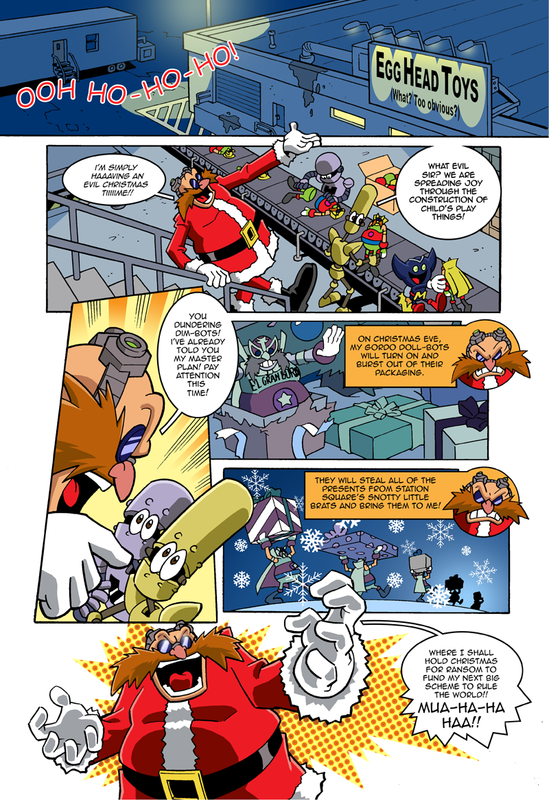 Yes folks, as a special Christmas treat I have commissioned Tracy Yardley to do the art, colors and letters for a 5-page Sonic Eggs Christmas special written by Sonic Stadium editor Jason Berry. You may remember Tracy doing some work for the main Eggs late in the summer. The first page is going up now, and it’ll be followed by a new page every day up to Christmas eve. But first, I know some of you have never read the Sonic X comic and may not be familiar with one of the characters in this special, “El Gran Gordo”. El Gran Gordo is basically Dr. Eggman’s “Good” persona. He was created by Ian Flynn around Sonic X #26 in which Eggman hatched a scheme to make extra money for his plots by posing a fake luchador wrestler. He used a form of trickery using heavy magnets and nanomachines to force his opponents to the mat. Chris Thorndyke (the snotty little rich kid in the anime XD) is a huge fan of El Gran Gordo while Sonic sees through Eggman’s disguise. Sonic challenged Egg-errr “El Gran Gordo” to a match and the two duked it out with Sonic as the victor. However, for the sake of Chris feelings, Sonic kept Eggmans persona a secret. Eggman ended up loving the adoration of the crowd and would then go on to show up in a few more issues. Even playing the good guy! Errrr…sorta. Even to the point of teaming up with Sonic and making him his new sidekick “El Rapido Azule”. In Sonic X #32, Sonic finally forced Eggman to give up his “El Gran Gordo” persona. Guess he’d a rather have Eggman as a villain than to share the spotlight of adoration with anyone. It should also be noted that Eggman has a huge crush on the Thorndykes heavy housemaid Ella (both of which are voiced by Mike Pollock in the anime). While Ella can’t stand Eggman, she does have a thing for El Gran Gordo. Here it is, everybody. The final page. Not much to really say about it, honestly, except that it’s probably one of my favorite pages Yardley! did. So I’ll end this feature with some talk about both ECC and Tracy Yardley! Emerald Coast Comics is a web comic website, run mostly by people who aspire to become professionalism in the comic book industry. The comic projects on the site are used to give writers and artists a conduit through which to practice and hone their skills, as well as bring to life characters they’ve loved since they where children. Sonic Eggs isn’t the only comic on the site, and you are certainly welcome to check out a few of the others for yourself. ECC is a lot like SonicVerseTeam of old, except it does all of it’s comics in-house and has, over the years, developed stricter quality control measures to ensure most things on the website are a step up from your typical web comic fair, aside from a strip called Staffers, which is mostly used as practice for new artists. We do occasionally give out commissions to smooth out the process, such was the case with Tracy Yardley! If you want to commission Tracy Yardley, whether it be a comic page, or just a damn cool piece of art, contact him on his DA. a penciled and inked piece will run you around $120, plus an additional $10 if you want him to send the picture to you. Yardley!’s time is precious, as being a comic book artist can be rather difficult to make a living off of. Keep in mind that he does this professionally and very well when you take the price into account. Finally, I’d like to say that Yardley! is an absolute joy to work with. His e-mail correspondences where always fun and cheerful, he got each commission done promptly and quickly despite his busy schedule, and when he sent Jason the pages in the mail, he included a kind letter and some ashcan art books. Frankly, his personality and promptness alone was worth every penny. So, without further ado, I bring you the conclusion to Tracy Yardley’s run on Sonic Eggs, colored by Jamie Lee. The story doesn’t end here, though. Check out ECC next Saturday for future Sonic Eggs pages, penciled and inked by ECC Staff member Kichi. If you want this comic featured regularly on the front page, let us know. ECC’s Summer of Yardley continues this week with another page. This page is a perfect example of why Tracy Yardley! is one of my favorite people on the Archie Sonic book: the character interaction. For a single page, a lot is conveyed here, through facial expressions, movement, and stuff happening in the background. Despite Tracy’s simple style, he’s able to put a lot into his pages. He is probably one of the few comic book artists I know of who understand how much plot and story can be conveyed through how the characters act and move, not just what they say. This page was colored by Kichi, and lettered by the Illustrious Q. Sonic Eggs is an Emerald Coast Comics series. Sonic Eggs is probably one of my favorite web comics running. 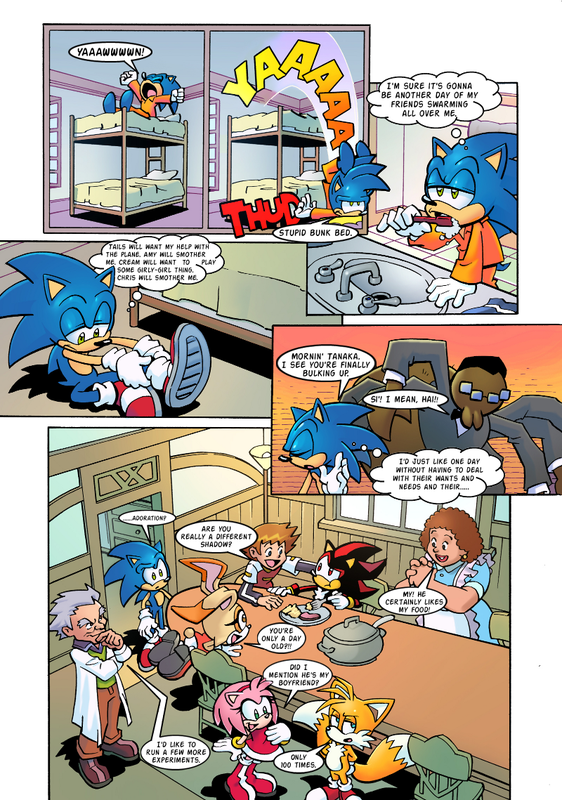 Acting as a fan continuation of Archie’s “Sonic X” comic book (which in and of itself was a strictly in continuity Sonic X storyline), Sonic Eggs is a weekly strip written by occasional Sonic Stadium contributor Jason Berry, and posted on the website Emerald Coast Comics. It both satirizes and pays homage to all things Sonic, while also making an effort to be (almost) as kid friendly as its source material. So why is this being featured in the community blog? Well, renowned Archie Sonic artist Tracy Yardley! * has actually done a series of pages for it, which will be running in the comic over the next six weeks! In addition to Tracy, Eggs also got another Archie talent, Ben Hunzeker. He did the shading for this page, as well another upcoming page. The flats for this page where done by Deebs. Unlike many pages in the comic, this page does not have an individual gag, though it is building to something later. For the thousands of you who don’t follow the series, Sonic Eggs’ current plot centers around “Shades”, and unfinished, sissy version of the dark brooding ball of emo! For those of you interested in catching up to the current plot, you can find the rest of the comic here. *The exclamation mark isn’t a typ-o, it’s part of Tracy’s name. According to Sonic the Hedgehog’s headwriter, Ian Flynn, this issue is meant to introduce the book to newcomers and to clarify plot points to veterans. The comic book itself has no storyline, but is instead more akin to Archie’s data files, a biography of the characters and a description of the world’s backstory. The book will also be offering some insight and spoilers for what happens in and after issue #200. Those of you wondering what this Sonic comic is all about might want to consider going to a comic book store to pick it up.